This free celebration will kick off at 7 p.m. at the North Manchester campus on the athletic fields off East Street. This family-friendly event is open to the public. 7:30 p.m. – Welcome by Jillian “Jay” Watts, director of MU CARE Initiative. 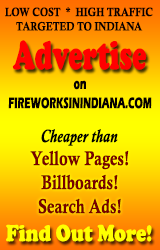 10 p.m. – North Manchester Fire Department will light up the sky with fireworks display. The soccer field bleachers are perfect for viewing, but arrive early; seats fill up quickly. Those who do not arrive early will want to bring lawn chairs or blankets. Bring the whole family for red-white-and-blue activities. Free activities include corn hole, sidewalk chalk, face painting and ladder golf. Glow sticks are provided by Timbercrest Senior Living Community. The North Manchester Lions Club will provide free flags. The Rotary Club of North Manchester will sell $1 hot dogs, $2 chili dogs or two chili dogs for $3, as well as $1 popcorn, water and soft drinks. For the safety of guests: Alcohol, sparklers and personal fireworks are not permitted. MU is a tobacco-free campus. The rain date is Saturday, July 7, same time and location.